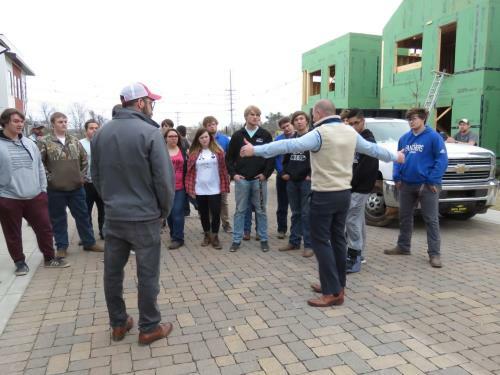 Chattanooga construction company Collier Construction welcomed Sale Creek Middle High School’s Applied Mathematical Concepts and Structural Systems students and teachers to its 100 at South Broad site for an exclusive educational tour. In these applied math and structural systems classes, students learn math in the classroom on rainy days, and they apply what they learn by working on building a tiny house when the sun is shining. Ethan Collier, president and CEO of Collier Construction, led a tour through houses in different phases of construction and encouraged and answered students’ questions. Senior Jack Bowman attended the tour and talked about the tiny house project. Collier Construction donated a $1,000 gift card to a major construction supply retailer to help the students finish their tiny house, but Mr. Caraccio says the students still need flooring and a mini-split air system, as well as siding. Anyone interested in supporting the project can call Sale Creek, and ask for Michael Caraccio at 423-332-8819. Servicing the Chattanooga area since 2001, Collier Construction is committed to building homes that provide for the economic health and well-being of the homeowners, the community and the environment. The team hopes that this tour inspired these young people and helped them see themselves in any one of these future jobs in the industry. Over the past two years, Mr. Collier has completed more than 55 homes in their community known as One Hundred at South Broad, with prices starting at $220,000. Mr. Collier most recently announced an expanded partnership with Uptown Firm as well as a $6 million townhome project on E. Main Street. In addition, they are working together at a new site called Reside North. This small development offers the only new residential construction in the North Shore area at a price point below $230,000.